Host an Ocean Themed Playdate for your kids and their friends. Choose a location such as your living room, backyard, park or even a rented space in your library. Pick a time of day and invite your friends. Prepare the activities ahead of time and set in different areas of the room. When the children come – play, learn, craft, and connect! We’re sharing 4 simple ideas that you can do at your next playdate. Fun and easy hands on ideas all about the ocean. 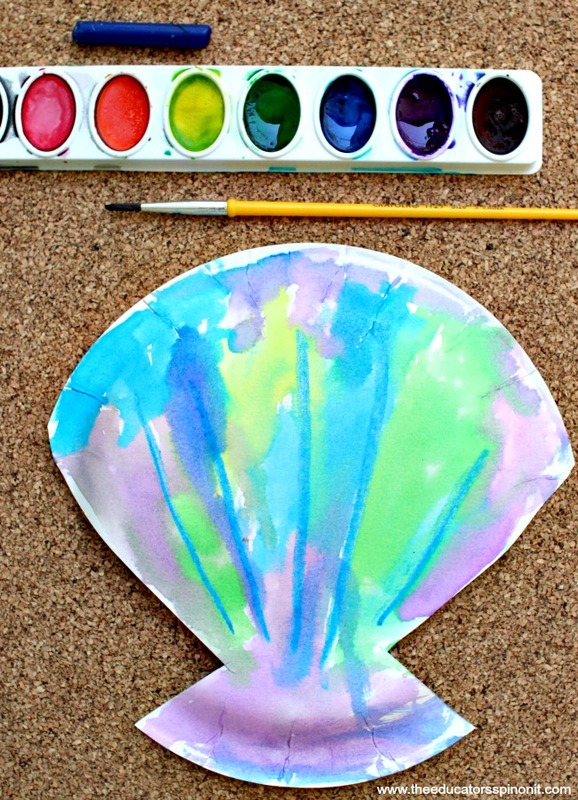 These ideas are best for ages 3-7. If you’re looking for more themed playdate ideas take a moment to SIGN UP for our Toddler Time Newsletter for more Playdate Ideas! Have parents pre-cut the shells or let the children, depending on the age and comfort level of the parents. Examine the lines in the real shells and talk about their direction. Encourage children to draw the vertical lines with crayon on their shells. Remember to have them go from TOP to BOTTOM in order to encourage good early writing habits. Water color paint over the crayon lines. The paint should resist the lines and show through. DK Eyewitness Books: Ocean Discover more about the plants and animals that live in the oceans. Although geared for ages 8-12, I like to select a page to share with my younger children. This exposes them to new vocabulary and science concepts without being too overwhelming. Magic School Bus on the Ocean Floor. I love these stories for helping kids connect to science topics with a mix of fiction and non-fiction. Depending on the age of the kids attending your ocean themed playdate – you may want to paraphrase some of the longer texts. I find when my child is alone, they are able to listen to longer stories. When in a group – short and sweet tends to do better! National Geographic Weird Sea Creatures. This book is just COOL. My kids adore looking at and reading about the unusual sea creatures . Pete the Cat: Pete at the Beach. Join a kid-favorite character as he spends the day collecting shells and making sand castles on the beach. Sea Shells by the Sea Shore: Count and identify shells with Sue as she collects beach treasures along the shore for her grandmother. Kids love to sort shells and this activity is a great way to combine math and science. Set out the shells on a flat surface. Encourage children to look at the size, shape, and colors of the shells. Sort the set of shells based on one attribute such as size. Re-sort the set of shells using another attribute. Fill the large container with water. Set on a flooring that will be ok if wet. Put a towel underneath. Set cups and ocean animals in the tub of water. 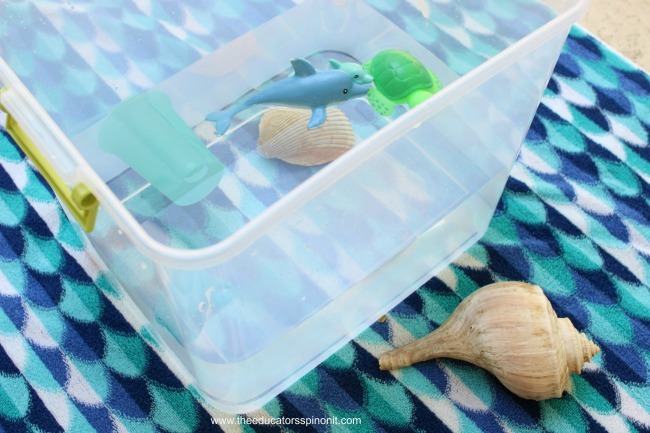 Let children splash, pour, and play with their ocean tub. Sign up for our Toddler Time Newsletter for more Playdate Ideas! That submarine is SO cool! My son would totally love that craft/activity. Stopping by from the Sun Scholars For the Kids linky and am a new follower. I'd love to have you stop by my site sometime (www.deceptivelyeducational.blogspot.com)!